Evanston Women's History Project » Blog Archive » 100 Years of Illinois Women Voting: Evanston Celebrates! 100 Years of Illinois Women Voting: Evanston Celebrates! Illinois women were able to vote for Presidential electors, shifting the balance of power in national elections. 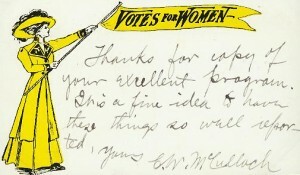 The victory in Illinois propelled the national suffrage movement into its final phase, leading to the ratification of the 19th amendment in 1920. For Evanstonians, this moment is even more important, as Evanston women were largely responsible for bringing this important victory to all Illinois women. To honor the occasion, a partnership of Evanston organizations, including EWHP, is planning a celebratory Suffrage Rally, Friday June 14, 2013 at 5 pm at the Frances Willard House, 1730 Chicago Avenue. Live music, historic re-enactments, and speeches by local officials will be featured. Led by the Evanston League of Women Voters, the partners include the City of Evanston, Evanston History Center, Frances Willard Historical Association, Woman’s Club of Evanston, and the YWCA Evanston/North Shore. Voter Registration will be available and eligible new voters are encouraged to come and register. The event is free and open to the public. As part of the celebration, the City of Evanston declared June 14, 2013 to be officially 100 Years of Women Voting day. Two other anniversary events are also being planned. On Sunday, June 2, 2013 at 4 pm, Lori Osborne, EWHP Director, and Cate Whitcomb, President-elect of the Evanston League of Women Voters, will give a “Views from the Porch” talk at the Frances Willard House, 1730 Chicago Avenue, titled: 100 Years of Women Voting: Illinois Women and the Fight for Suffrage in 1913. Featuring the stories of three Evanston women who provided leadership in the local, state and national suffrage movement, the talk will conclude with discussion about current issues of citizenship and women’s rights. Cost is $5, or $10 with a tour of the Willard House beginning at 3 pm. Reservations are encouraged as space is limited; please email info@franceswillardhouse.org or call (847)328-7500. On Saturday June 8, 2013 a showing of Iron Jawed Angels, the award-winning HBO film starring Anjelica Huston and Hilary Swank, will take place at the Evanston Public Library at 2 pm. Discussion will follow the film. The film tells the story of the national suffrage movement through its final struggles and eventual success in 1920. This event is free and open to the public. For more information about all of these events, additional statewide events, and the historical significance of the anniversary, visit the Illinois League of Women Voters website, www.lwvil.org/2013celebration. The June 14th Suffrage Rally is a Celebrate!2013 event. For more about the year-long celebration of Evanston’s 150th Anniversary visit www.evanston150.org.